» Windows b5 client bugs Welcome back, Guest. I've encountered a few bugs. First off, the program has a dehabilitating tendency to crash. This seems to happen pretty often when first installed, but evens out fairly quickly. I had several crashes within hours of installing it, but none for the last 9 or so. EDIT: Okay, it crashed twice more. Still a lot less than when it first installed, but clearly it's not something that resolved itself. 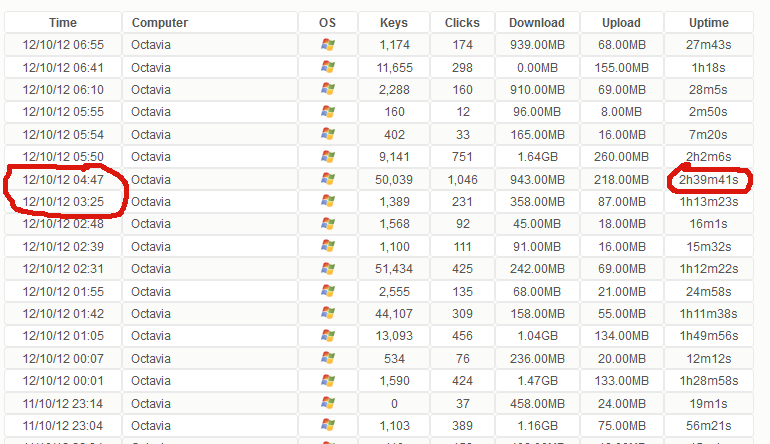 As you can see, he has pulsed 1.32GB, has 31.46MB unpulsed, but the client records more than 10 times that. This was an error with the 2GB bandwidth overflow, not the fault of the crash. This seems to occur when you hit 2GB, and goes back to normal at 4GB. Maybe a 32-bit integer issue? 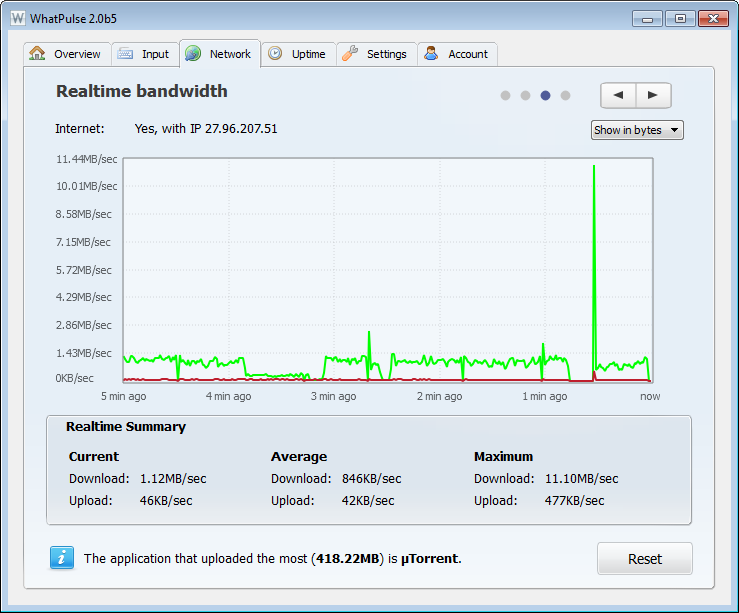 If the program lags at all, it'll "spike" bandwidth. It does seem to count the correct amount though, and as it's pretty obvious that that's not legitimate and "peak bandwidth" isn't recorded as a stat, it's not a huge problem. Thanks to ajhgfa and Cameron_D for being immensely helpful in testing out the program and providing screenshots for me. In addition, the new stats don't seem to support more than one page (35 users). Oh, and apparently WinPCap doesn't install on Windows 8. This doesn't seem to make a huge affect on the program. Frequent crashes occur, but that happens normally, anyway. It seems that autopulsing by bandwidth simply fails to pulse. I'm not sure what the cause could be here. And the second most recent pulse's bandwidth... I don't even know. That was meant to be over 2GB. EDIT: It appears that pulsing an amount larger than 2GB doesn't work. I'm testing to see if the alleged reset at 4GB fixes it. 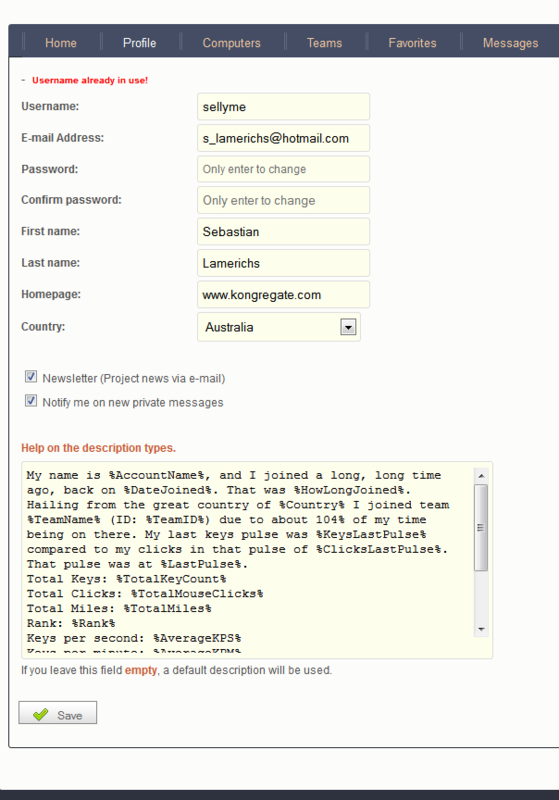 I, err... just tried to edit my profile. Apparently I can't do so without changing my username. 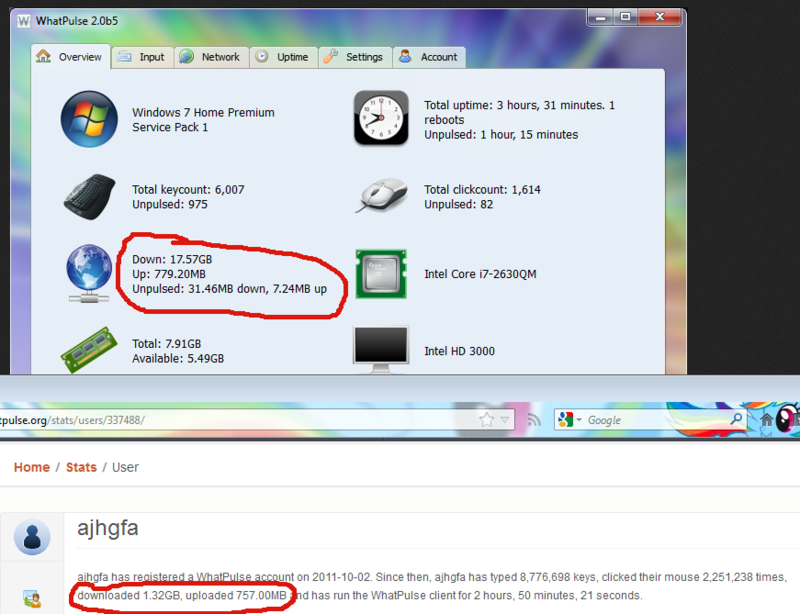 With regards to bandwidth stats: At 2GB unpulsed, it overflows to 16.7TB. If you pulse that, it'll return 0.00. At 4GB unpulsed, it resets at 0.00GB and starts counting normally again. If you pulse, it'll return the amount shown, i.e., your pulse minus 4GB. So yeah, pulse every 2GB or less. There also seems to be fairly large gaps in the network interface recognition. Two laptops that I've encountered (a Toshiba Satellite L730 with an Atheros AR9002WB-1NG Wireless Network Adapter and an ASUS U31F with a Realtek RTL8191SE Wireless LAN 802.11 PCI-E NIC) both fail to pick up the wireless card, and Cameron_D's server (Gigabit Ethernet, VMware PCI Ethernet Adapter - Packet Scheduler Miniport) isn't recognising bandwidth stats either. It recognises my Realtek PCIe Gigabit Ethernet though. Sorting by download, upload or uptime on a team page does not appear to do anything. That's because you're on the second page and it's numbering people incorrectly. Clicking page 1 or previous brings me to /?page=1, it looks like i.imgur.com/a0uDc.png. I'm guessing it should take me to /?page=0, where it has negative numbers.